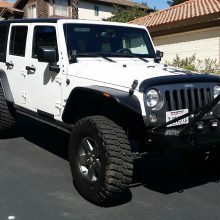 Bushwacker fender flares are made to do a number of things – they completely cover your tires, to keep you straight with Johnny Law, they absorb impact if you happen to meet the unexpected tree or bolder, and they look great. 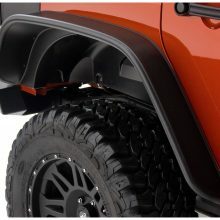 Bushwacker makes their fender flares out of a proprietary “Dura-Flex 2000 TPO” material, that they claim is the thickest and most flexible material available. 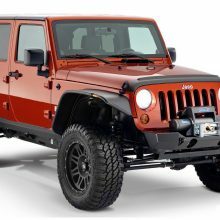 Bushwacker fender flares are designed to not fade (they’re 100% UV protected – something I wish that Jeep / Mopar could pull off), so they’ll look great for years. 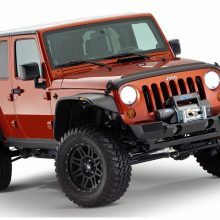 Bushwacker Fender Flares are the go-to choice when you’re trying to cover some big tires. They’ve been around for years, and most everyone has heard of them. 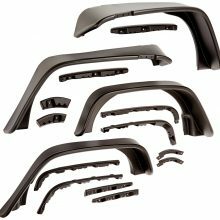 The reason that not everyone runs them is the price – you can’t always drop $500 on a set of fenders. 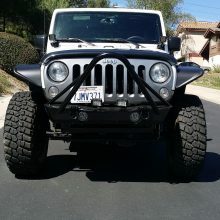 That’s the main reason for my less than perfect rating – the flares themselves are great, but it’s close to the price of metal flares. I’d like to point out that the turn signal on these guys is outstanding. 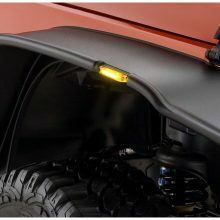 It’s a high quality LED that works well – other companies give you a cheap turn signal that just doesn’t fit with the price (I’m looking at you Xenon). The install isn’t hard, but you need to follow the instructions. 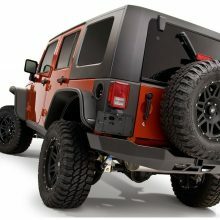 The flares stay on well, since they’re bolted directly to the body of your Jeep, without you having to drill holes. 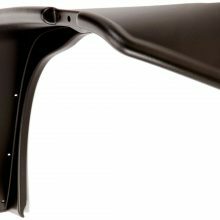 You will have to trim your inner fender though, and I had to use a drill bit to open up a few of the holes in the fenders. Finally, you can’t beat Made in the USA.